The FLUXUS F704 Thermal Energy is specially designed for heat and cold quantity metering within industrial environments and is thus also available as hazardous area approved variants (ATEX, IECEx Zone 2). Like all measuring systems of the FLUXUS series, the F704 Thermal Energy measures the volumetric flow rate non-invasively via its clamp-on ultrasonic transducers. 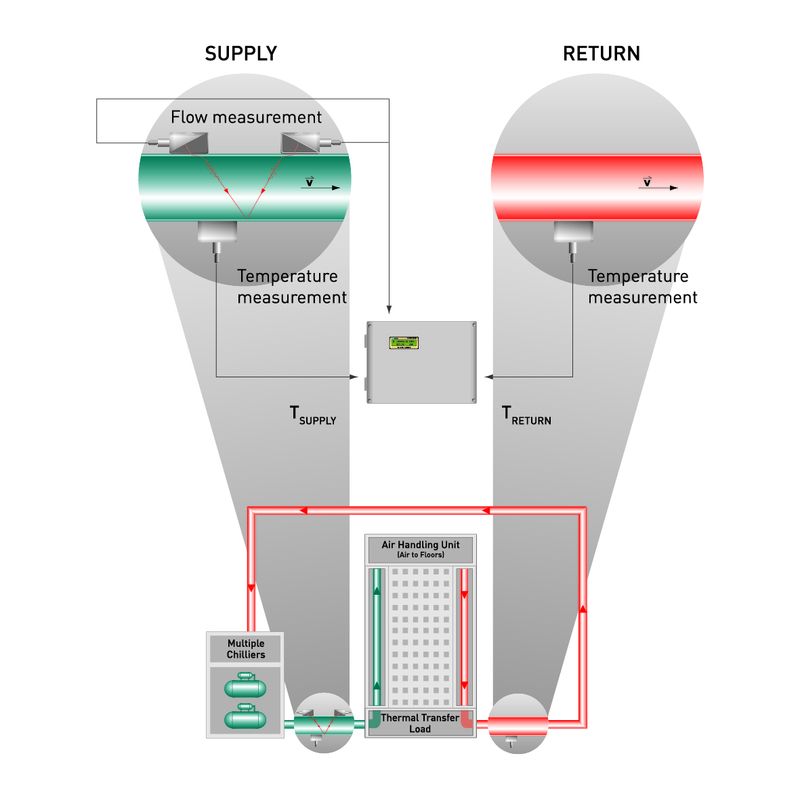 Simultaneously, temperature probes monitor the temperatures at the supply and return lines of the heating or cooling system - either non-invasively with clamp-on technology or by use of wetted temperature probes. From the temperature difference as well as the measured volume flow rate and on the basis of the physical media parameters stored in the internal database of the transmitter, the heating or cooling performance is calculated. With the help of the built-in totalizer function the F704 Thermal Energy can also be used as an energy meter. - to allow accurate measurements even at strongly disturbed flow profiles by compensating these. Another important advantage of FLUXUS F704 Thermal Energy lies within its high zero point stability and unrivalled accuracy even at very low flow rates - signal drift and significant measurement uncertainty, as it can often be observed at magnetive-inductive heat quantity meters when measuring at low flow rates, can be ruled out. Moreover, even potential mineral deposits on the inner pipe wall cannot influence the measurement. The range of applications of the F704 Thermal Energy is almost unlimited, not only in terms of pipe dimensions (from 6 mm up to 12.000 mm), pipe materials and their manufactured quality (e.g. badly manufactured GRP pipes or rusty steel pipes) and temperatures (from -190 ° C up to + 650 ° C) but also in terms of flowing media - from process and cooling water, to thermal oils or cryogenic media. Both the ultrasonic transducers and temperature probes are carefully paired and matched by FLEXIM. Due to these processes, the system measures with a high degree of accuracy and repeatability - even in applications with only small temperature differences, such as in cooling water circuits. The clamp-on ultrasonic sensors are well protected in extremely robust stainless steel mounting fixtures and withstand even the harshest mechanical stresses. 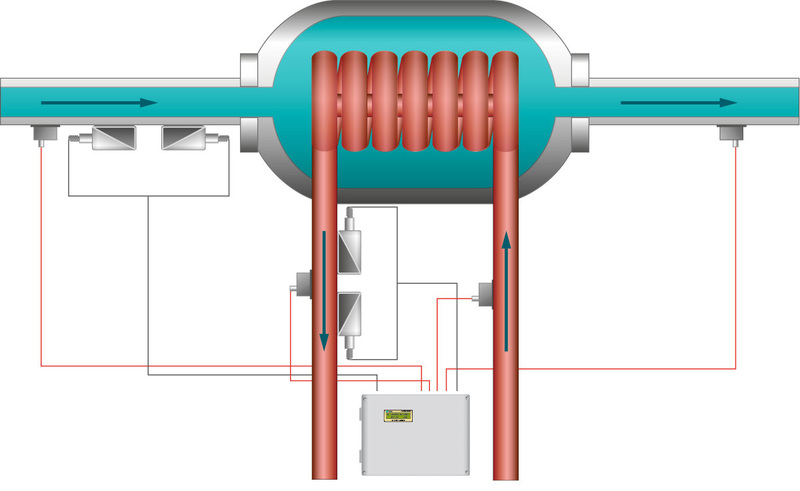 Thus, the FLUXUS F704 Thermal Energy offers the best metrological basis in terms of precision, long-life time, maintenance-free as well as cost-effective monitoring of thermal energy flows within industrial environments and thus forms the foundation for further process optimization tasks within the scope of a holistic energy management system - e.g. according to DIN ISO 50001.